Japanies style jigger available in 25/50 ml and 30/ 60ml sizes and colors are available as per requirment. As an eminent enterprise, we trade and supply a supreme class collection of SS Bar Tools Set.Our clients can avail these set from us in varied designs, patterns and looks at most affordable price. 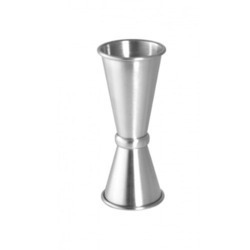 - Quality jiggers are an important part of full bar setups to ensure correct measurements when making cocktails. - This 1 oz. (30 ml) x 2 oz. (60 ml) Stainless Steel Jigger has capacities in ounces stamped into each portion so that the indication will not rub off or wear out. Bar Stock Made out of Steel and Aluminium in Various pitch configuration. Our entity is providing an extensive series of Bar Colored Set to our customers. Our products are developed utilizing the top quality raw material, bought from knowledgeable merchants of the industry. In addition, industry professionals check our presented product in order to deliver reliable series to our customers. With the help of our creative thinking and high-tech infrastructure, we are able to manufacture a plethora of omega bar tools. These are well polished and finely finished. Our exclusive collection is free from scratch and flawlessness. Our range is the premium choices of our clients. We have gained expertise in offering a highly comfortable range of Bar Tool Set to the customers. 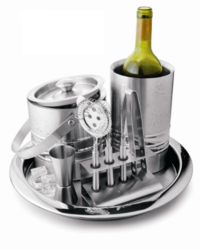 Pourer, Caddy , Condiment, Kot Holder, Store & pour, Glass Rack, Bostonshaker , Glass, Rimmer , Bartoolset.